The percentage who say things are good is up from 29% last October to 32% in December, 36% in February, 38% in May and 41% now. "The 41% is the largest number of Americans with a positive view of the economy since Barack Obama became President, and it represents the highest rating for the economy since the last recession officially began in December of 2007," says CNN Polling Director Keating Holland. The poll's Friday release preceded the Labor Department's report on July unemployment. And it hits two days after new data showing that the economy bounced back in the spring, growing at a 4% annual pace in the second quarter. That's better than what economists had expected. Revised numbers from that Commerce Department report also showed that the economy's winter contraction wasn't as bleak as first reported. 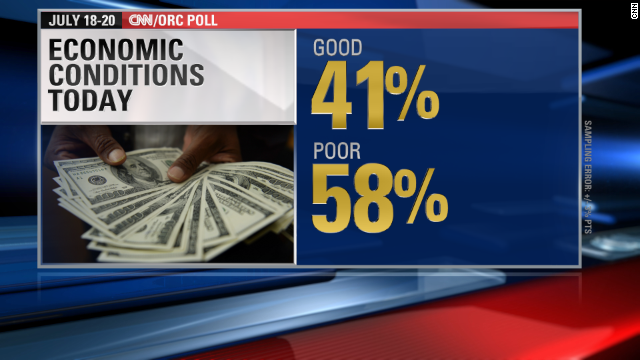 When it comes to perceptions about the economy, the CNN poll indicates a geographical divide. "People in the Northeast, Midwest and West all appear to see some improvement in the economy. The number of Westerners who say the economy's in good shape has nearly doubled, and there are 15-to-18 point gains in the Midwest and Northeast. "But it's a different story in the South, where the number of southerners who give a thumbs-up to the economy has remained stubbornly stuck at 34%, suggesting either that better times have yet to visit the South or that southerners have yet to perceive that things are getting better," Holland adds. The poll also indicates a small gender difference as well, with economic optimism growing more rapidly among women than men. Perceptions about economic conditions will be an important factor in November's midterm elections, as the economy remains the top issue on the mind of Americans. According to CNN poll numbers released last week, 49% of those questioned said it was extremely important for the President and Congress to deal with the economy, higher than any other issue tested. More than a third of the Senate and the entire House are up for grabs in November. In the House, the Democrats would need to pick up an extremely challenging 17 Republican-held seats to win back the majority from the GOP. Obama said Wednesday that "there are a lot of good reasons to be optimistic about America. We hold the best cards. Things are getting better." But when it comes to the economy, the President and congressional Democrats blame the GOP in Congress for putting up roadblocks to measures that would help the middle class. Congressional Republicans return the fire, saying that Obama's economic policies are not working. The poll was conducted for CNN by ORC International from July 18-20 with 1,012 adult Americans questioned by telephone. The survey's overall sampling error is plus or minus three percentage points. Great spin headline CNN. I'm listening to the prez right now and its the same old blame game. Always someone else's fault. Time to actually lead Mr. President. Dig into the stats behind he numbers people. My favorite idea from the REALLY ignorant Obama supporters goes something like this, " Look at my 401k under President Obama" or " DJIA breaks through 17,000 ....thankyou Mr. President." This is the idiocy that people hang their hat on when it comes time to vote. Do the HOMEWORK people! Dig into the numbers behind he stats people. My only idea, as a REALLY ignorant RWNJ goes something like this, "Everything wrong is the fault of President Obama" or " Derpa derpa dew....." This is the idiocy of the people I hang with. Just WATCH fox news people! The Republican nightmare: they shut down the government; refused to pass any jobs bills; tried to prevent anything from getting better- yet it has and continues. Unemployment down, maker up, wages up (a little), corporate profits at record levels. The GOP is facing an election when they'll have to stand and say "we did nothing to help America, and we sued the President for trying to fix our mess". Not enviable boys, not enviable. I can simply say that the change Americans should believe is becoming a reality....its vintage Obama's. -what a pity, these idiots cry on English language, because they are losing their ground on the party they support. Pathetic. Their nightmare is they lose like a hell in next elections–it is Democrats landslide victory. None of the republicans qualify for WH, May be for cook jobs. Hope the GOP House enjoys their 5 week "recess" after doing absolutely nothing for the American people, except wasting over 1 million bucks on this stupid lawsuit, all to appease their far radical base. Speaker of the House can't tie his shoes without permission from the tea party. Voted against raising the minimum wage but these turkeys voted a cost of living salary increase for themselves starting January 2015. Yea yea yea. What about the 1 million who don't have jobs now that had them before Obama took office? How can his policies not be working when none of them are allowed to be implemented. Good is a "relative" term...it is arguable.........Better is really not arguable....things are one heck of a lot better than they were in 2007-2009, no question about that one. To CNN, we the majority of Americans know this President is lost. Your bias for him is seen as a joke. No one believes you are real journalist. Hello America and Americans all. The top 1/ 2% are you really hurting Tax wise?? actually no. Middle class republicans refuse Dems EITC proposals normally non partisan. No to corporate tax rate reductions while eliminating long ago not needed tax credits to corporates. And the GOP sit by as many US multinationals use " inversion" to avoid US corporate taxes.... If that aint the same as outsourcing manufacturing jobs I don't know what is. But the GOP ( Grand Old Profiteers)... continue to be in this sense another 'form of US isolationism... business first, of for and by the people err ... what's that? You don't need polls to show economy is good. Our border crisis has demonstrated that economy is good.